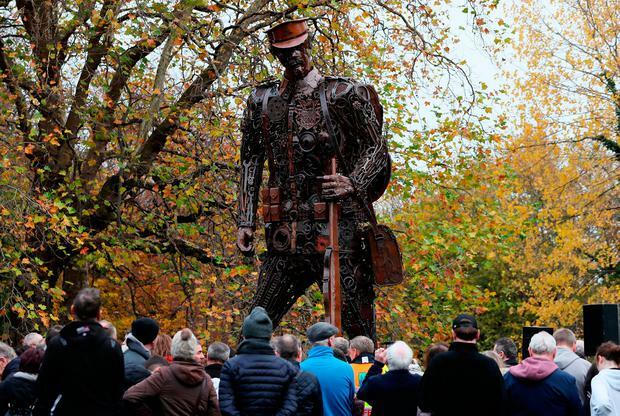 A sculpture created from scrap metal depicting a weary soldier to commemorate the centenary of the ending of World War I has been unveiled. Culture Minister Josepha Madigan launched the art installation at a special ceremony in St Stephen's Green, Dublin, yesterday. Created by Dorset-based artist and blacksmith Martin Galbavy and constructed by Chris Hannam of Dorset Forge and Fabrication, the six-metre 'Haunting Soldier' is designed to evoke the fragility and suffering of those who survived the war and returned home to an uncertain and difficult future. It was made from scraps of metal, including horse shoes, spanners, car jacks and brake discs. The ghostly figure was brought to Ireland by Dublin-based solicitor Sabina Purcell, who discovered that she had a family connection to those who had served in the Great War. It led her to explore how she could remember and commemorate the soldiers from the island of Ireland who fought in the war, both those who died and those who survived. When she came across photographs of the sculpture, it resonated with her and she decided to bring it to Dublin. Ms Madigan said: "I congratulate Sabina Purcell for her vision and commitment in bringing this beautiful and thought-provoking sculpture to Dublin. It is a great achievement." She said the centenary commemorations were shining a light on the stories of the many men and women from across the island of Ireland who sacrificed their lives in WWI. The sculpture will be on show near the pond in St Stephen's Green until November 26.